We are proud to offer this selection of specialized Space Shuttle, ISS and other select space-modeling detail products. They are the result of our work here at the SpacePort, over many months. They are offered in hopes that they will help you build the best looking Shuttle Orbiter model you can build. NOTE - These items are also on sale on eBay, therefore quantities will deplete from time to time. If an item is not available when you put in an order from this site, you will get an email update, informing you when the next production batch is to become available. You can decide to wait to order to keep your order open for completion upon production of new inventory. Note - All Shuttle Orbiter Thermal Protection System (TPS) Decal Sets are now made in "modular" fashion. The "Standard Black Tile Decal Sets" are the foundation, providing the majority of the black TPS tile markings, which are common to all Shuttle Orbiters. The "Early Era Orbiter White Tile Decal Sets" are designed to complete the TPS markings for the two early Orbiters in the fleet - Columbia & Challenger. The "Late Era Orbiter AFRSI & White Tile Decal Sets" are designed to complete the TPS markings for the three later Orbiters - Discovery, Atlantis and Endeavour. The "Cloth Tape AFRSI Application Guide" shows how to use Johnson & Johnson Cloth Tape to create an AFRSI "blanket" covering with more visual "texture," but is intended only for expert model builders. Choose your decals sets in accordance to the Orbiter you intend to build. When you click on the price of any item, you will open the "Contact Us / Order from Us" page, in which you can provide your shipping information, e-mail address, and the items you wish to purchase. LCSP will then reply with a Pay Pal invoice, for all items, plus shipping. The prices shown here do not include shipping. Shipping costs will be calculated and shown on the invoice at the time of payment. As we use USPS Priority Flat Rate Shipping, U.S. Domestic 2-day Service is typically $5.75. International Priority Mail costs will be higher, and will depend on the destination country. Since USPS Priority Mail Flat Rate Shipping covers up to 70 lbs. (! ), for one price, it is best to "bundle" your purchases together, rather than pay for multiple shipping fees! If ordered directly from the Website and purchase two or more items - Domestic Shipping is FREE! For a downloadable PDF copy of our Product Catalog, Click Here! The Space Shuttle Payload Bay Detail Set you are looking at are scaled to fit the components of the 1/72 scale Monogram/Revell Space Shuttle Orbiter models. The images used to create the applications were pulled together from hours of research into NASA photographs of Shuttle operations within the Orbiter Processing Facility during servicing and payload installation or removal. This detail set does not provide the same elements as other Payload Bay "Upgrade" set previously sold by other modeling suppliers. It attempts to create a "photo-realistic" interior surface to the Orbiter's Payload Bay. The 1/72 scale set provides pressure-sensitive applications for the forward and aft bulkheads of the Payload Bay, applications for the Payload Bay Floor and Side Panels and applications for the aft end of the Bay's Wiring Chases, which are already molded into the floor element of the Monogram model's Payload Bay. The 1/144 scale set provides pressure-sensitive applications for the forward and aft bulkheads of the Payload Bay, applications for the Payload Bay Floor Panels and applications for the Bay's Wiring Chases, which are not properly molded into the floor of the Revell model's Payload Bay. 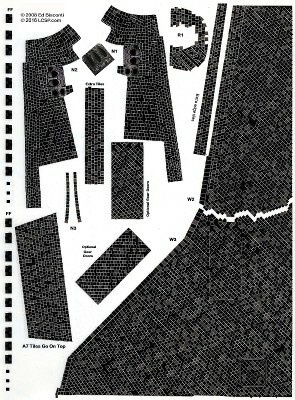 These elements are printed onto the self-adhesive material and must must be "trimmed-down" using a sharp hobby knife, such as an X-Acto #11, so this detail set is recommended only for experienced modelers. The set also provides instructions on necessary additional items needed to do the job, tools needed, and proper installation of the applications and user-provided plastic stock materials. The photographs supplied provide an indication of how well the detail set works. These items were originally made for the two Monogram 1/72 scale Shuttle Orbiters I am currently working on. The 1/72 scale version is designed for the Monogram Orbiter, but can be used with the Revell Orbiter model as well. the 1/144 scale version is intended for the Revell, Dragon and Minicraft Orbiter models. Full-color instructions are included with the decal set. The Shuttle Orbiter Standard Black Tile Decal Set must be paired with a specific White Tile/Blanket Decal Set in order to complete the overall TPS system for the specific Orbiter you are modeling. >>the Early Era Shuttle White Tile Decals Set. >>the Late Era Shuttle AFRSI & White Tile Decal Set. The 1/72 scale version is intednded for use on the Monogram and Revell 1/72 scale Orbiters. The 1/144 scale version is intended for use on the Revell, Airfix, Minicraft and Dragon 1/144 scale Orbiter models. We are also offering this set in 1/100 scale for the Tamiya Orbiter model on a "made to order" basis. If 1/100 sale decals are requested, please add 6 days handling for product production. We manufacture these sets by hand, in small batches, typically five sets at a time. Currently, the 1/100 scale are "made to order,"so please allow extra time for production. By combining the Early Era Shuttle Orbiter White Tile Set with the Shuttle Orbiter Standard Black Shuttle Tile Decal Set, you will be able to replicate the overall tile patterns for either Columbia or Challenger. The set comes with four sheets of specifically designed white tile decals, one sheet of generic “white tiles,” to apply the OMS Pod front surface tile coverings, or use as replacement stock. The set also comes with a four-page instruction guide. The 1/72 scale version is intended for use on the Monogram and Revell 1/72 scale Orbiters. The 1/144 scale version is inteded for use on the Revell, Airfix, Minicraft and Dragon 1/144 scale Orbiter models. 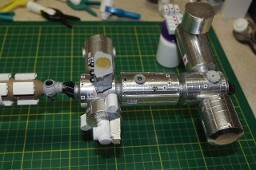 Space Shuttle Orbiter Flexible Thermal Protection System Replication Process for 1/72, 1/100 & 1/144 scale. This is a concise guide on the Flexible Reusable Surface Insulation System (FRSI) process I created to do the FRSI "blanket" type thermal protection system on the last three Orbiter models I've built and profiled on my website – LakeCountySpacePort (.com). The guide provides the background of how the process began, tips on the creation and application of the surgical-tape-based "blanket" sections, and the maps I have created to provide the locations for the different sizes of FRSI blankets onto the surface of the Orbiter, based on both NASA and personally-shot photographic data. While my original work was done in 1/72 scale, reducing the dimensions of the blanket components by 50% will allow the same process to be applied to 1/144 scale models of the Orbiter as well. The Late Era Shuttle Orbiter AFRSI & White Tile Decal Set is being offered as an alternative to doing the Johnson & Johnson tape-based AFRSI Application Process. By combining the Late Era AFRSI & White Tile Decal Set with the Standard Shuttle Tile Decal Set, you can complete your model’s Thermal Protection System. You will still need to properly pre-paint the model with the proper base colors. To create these decals, I found documents published by USA (United Space Alliance), the former Shuttle processing contractor, which contained drawings of the port side of the Orbiter's forward section (hatch side), as well as the port side Mid-Body. I was also able to find a drawing of the vertical stabilizer, in a very low-grade of resolution. Using this artwork as “feed stock,” I revised the original white tile nose sections for the Shuttle Tile Decal Set, re-did the artwork for the vertical stabilizer, added "strip sections" of AFRSI for OMS Pod work and other "touch-ups," added the "still required" sections of the original Shuttle White Tile decals for the area around the cockpit windows, included a properly tiled front window frame. The set is printed on Clear Decal Paper stock. AFRSI for Port & Starboard Inner Wing Upper Surfaces and AFRSI Panels behind the leading edges. Additional AFRSI strips for repairs and completion of the OMS Pod surfaces. The Late Era Shuttle Orbiter AFRSI & White Tile Decal Set must be combined with the Shuttle Orbiter Standard Black Tile Decal Set in order to complete the overall TPS system for the specific early Orbiter you are modeling. The set comes with four sheets of specifically designed tile & AFRSI decals and a four-page instruction guide. 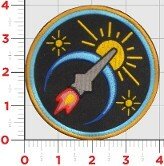 The Lake County Space Port Late Era Shuttle Orbiter White Tile Decal Sheet is intended to be used in conjunction with the Johnson & Johnson Cloth Tape AFRSI Application Method. White Tiles for Forward Fuselage & Crew Compartment - cockpit area top, body areas behind and in front of cockpit windows. 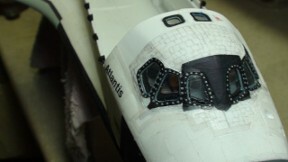 The Late Era Shuttle Orbiter White Tile Decal Sheet must be combined with the 1/72 scale Shuttle Orbiter Standard Black Tile Decal Set and the Johnson & Johnson tape-based AFRSI Application Process in order to complete the overall TPS system for the specific late-era Orbiter you are modeling. All decals are printed using Clear Decal Stock, so proper pre-painting of the Orbiter must be done prior to applying the decals. Please read the decal set instructions for details. LCSP recommends the use of the 1/72 scale AMP Shuttle Window Set for all high-resolution Orbiter models. Just Google "AMP Shuttle Windows" to find their website. 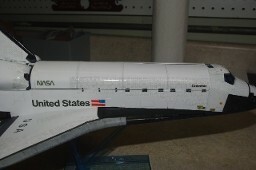 The Space Shuttle Detail Application Set is a unique set of label-type applications designed to help make your spacecraft model more historically accurate. Each shuttle has unique tile arrangements and so you must research your photos online and offline in books to accurately depict the particular spacecraft you desire to do with the additional extra tiles included in this set. The instrument panel surfaces of the Orbiter Flight Deck. Main Engine Close-Out Covers for the openings of the Space Shuttle Main Engines. We also provide very small red rubber bands to replicate the draw cords used to hold the covers on the engine bells. These have been printed on white, self-adhesive label stock and must be carefully cut out for placement onto the model. As such, this set is only recommended for experienced scale modelers. All applications are printed on matte white label stock, with the exception of the three SSME close-out covers, which are printed on gloss white stock. These elements must be "trimmed down" using a sharp hobby knife, such as an X-Acto #11 knife blade, so this detail set is recommended only for experienced modelers. All of the applications can be seen in the 1/72 STS-134 "Endeavour" build page, except for the SSME Close-Out Covers (shown here). The set is only available in either 1/72 or 1/144 scales. We are not offering this set in 1/100 scale, as there is no "Shuttle Stack" model available in this scale. Please make sure and specify the correct set number in your order. The concept of “photo-realistic” modeling, promoted by Edu-Craft Diversions and their incredibly elegant heavy-paper models, has become the genesis of many of the SpacePort’s product offerings. This one, is no exception. In looking over the molded patterns on the Revell Germany ISS main solar panels as supplied, I found that painting these by hand would be very time consuming, and would still not yield the correct look for the panels as they exist on the Station. There may be a way to use ISS photos to achieve the correct look. In trolling through the NASA photos, I was able to find enough clear photos of the Main Solar Arrays and the Russian Solar Panels that I could use that graphic data to fabricate direct-application panels to do those jobs. Along the path, I also found other areas of “opportunity,” for which good photo detail data was available. These would, when applied, add even more depth and detail to the finished model. There are also provided to you for your use, as tried and proven on my ISS model build. 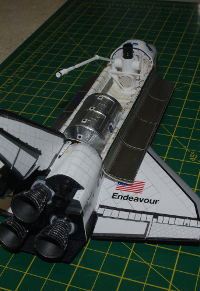 This application set comes directly from our own work on the Revell ISS kit build-up project. They are hi-resolution printed onto white-background stock and come with all of the printed panels indicated below. Some of the panels provide spare markings, in case you run into difficulties. 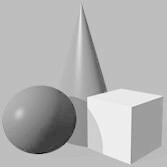 The basic rules of use of the application set, as well as guidance on building the rest of the model, are provided in a 10-page illustrate instruction manual. The original ISS Applications Set is printed onto white, self-adhesive label stock. We now offer a version of these applications printed onto white water-slide decal paper. The decal-based set takes more time and materials and therefore costs more to make. These Atlas “livery markings” are based on artwork done in 2016 by Boeing to show the CST-100-Centaur configuration, just after achieving orbit. The markings are based on the actual set of program logos that are typically placed onto an Atlas V launch vehicle for each mission. These marking depict the agency in charge of the flight, the Atlas program insignia and the payload contractor. In this case, the NASA "meatball, the Commercial Crew Program Office logo, Boeing logo and the United Launch Alliance logo were added by the artist. 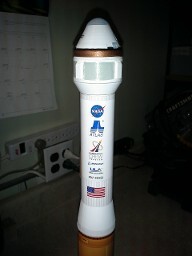 They are placed onto the Centaur stage tube wrap of the model, above the U.S. Flags. Boeing "Starliner" markings are also provided for the exterior of the CST-100 itself. The set is printed on white water-slide decal stock. A new addition to our offerings! A six-color rendering of our LCSP logo as a 4-inch iron-on patch. Place it on your workshop overalls, a favorite T-shirt or commemerative jacket.